Our Refreshment Stand features mobility, storage and more...on-the-door storage and large cabinet interior with an adjustable shelf make this refreshment stand an asset in any office. Large melamine top, 29-1/4"W x 20-1/2"D, can hold a microwave or other breakroom equipment. Double doors feature three built-in steel shelves with lip to keep contents in place. Interior shelf measures 25"W x 11-3/4"D and is height adjustable. Four swivel casters (2 locking). 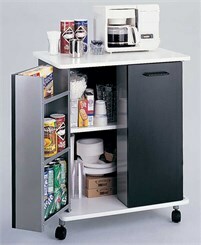 Black laminate cabinet with aluminum trim and white easy-to-clean melamine service top. Assembly required. Measures 29-1/4"W x 20-1/2"D x 33"H. Shpg. wt. 92 lbs. PRICE INCLUDES SHIPPING! Please allow 1-2 weeks for delivery.